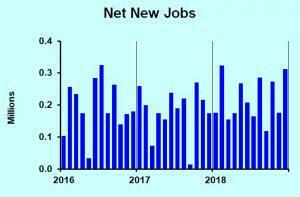 The net gain in jobs in December 2018 was the second highest of the year and substantially above average, according to the Bureau of Labor Statistics monthly report. Employment increased by 312,000, compared to a monthly average of 220,000. This comes at a time when many are proclaiming an economic slowdown, and some even see a looming crash. One month of gain does not deny the possibility of a recession beginning later this year, so it’s wise for organizations to do some contingency planning for a recession. But it is far too early for doom and gloom as a base case scenario. The government shutdown did not figure into the December data, which actually is based on surveys taken early in the month. Both government workers and contractors may be cut from payrolls when January data are released next month. There could be ripple effects as well, but they won’t overwhelm the underlying trend in the economy. Wage hikes continued, and even accelerated, last month. The 12-month change was 3.2%, at the high end of recent data. Workers are hard to find, and employers are sweetening pay offers to attract talent, or at least warm bodies. The unemployment rate ticked up, but within the range of normal variation. We economists always caution against reading too much into one economic data point, but this report is notable for running against the grain of so much recent opinion. The employment report does not define the path that the Federal Reserve will take this year, but it argues for giving more weight to tightening. Jerome Powell reiterated that the Fed is not on a fixed path, but would adjust monetary policy as the data emerge. I anticipate more interest rate increases than the Fed’s expectations for two more hikes in 2019.